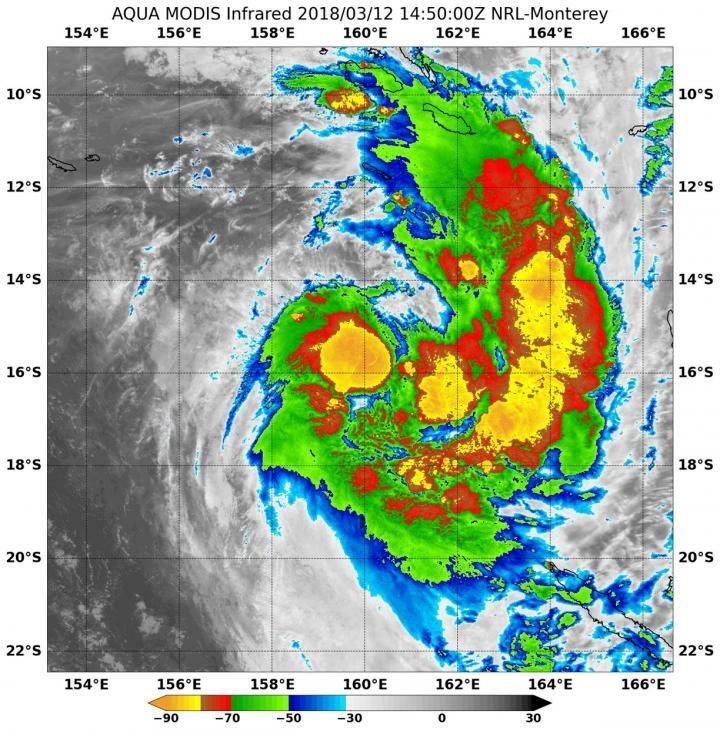 Infrared satellite data showed Tropical Cyclone 13P quickly developed powerful storms with very cold cloud top temperatures. NASA's Aqua satellite analyzed the system in infrared light to determine where its strongest storms were located. Tropical Cyclone 13P formed in the Coral Sea, located in the Southern Pacific Ocean. Infrared light provides valuable temperature data to forecasters and cloud top temperatures give clues about the location of the highest, coldest and strongest storms. On March 12 at 10:50 a.m. EDT (1450 UTC) the Moderate Resolution Imaging Spectroradiometer or MODIS instrument aboard NASA's Aqua satellite analyzed Tropical Storm 13P's cloud top temperatures in infrared light. MODIS found cloud top temperatures of strongest thunderstorms were as cold as or colder than minus 80 degrees Fahrenheit (minus 62.2 Celsius) in two areas: around the center of circulation and in a band of thunderstorms east of the center. Cloud top temperatures that cold indicate strong storms that have the capability to create heavy rain. The Joint Typhoon Warning Center issued the first bulletin on 13P on March 12 at 11 a.m. EDT (1500 UTC) when the center was located near 15.7 degrees south latitude and 159.9 degrees east longitude, about 497 nautical miles west-northwest of Port Vila, Vanuatu. 13P had maximum sustained winds near 35 knots (40 mph/62 kph) and was moving to the south at 12 knots (13.8 mph/22.2 kph). The Joint Typhoon Warning Center expects that 13P will continue strengthening while moving will move south, later southwest. However, adverse conditions are expected to dissipate the storm in four days.